The suit and tie are back, but this time as an act of rebellion in the land of Fendi. Silvia Venturini Fendi pushed in so many directions this season, playing with opposites and contrasts, and working with her friend Karl Lagerfeld in a fusion of old and new, formal and sporty. Her most powerful stroke, though, was thrusting tailored clothing — with a few twists — back into the limelight. “Today, for a young kid, or for somebody who didn’t experience it before, to be in a suit and tie is the most subversive attire. I wanted to see all those men approaching a classical mood,” said Venturini Fendi before sending out a lineup of suits in gray with a glassy sheen, or caffe latte, or two-toned for all the indecisive men out there. Jackets and topcoats alike had the new Lagerfeld collar, with a soft shawl on the right and a notch lapel on the left. Tailoring had lots of fresh edges: Roomy suits were done in wool shot through with silver threads or nylon, and some were layered with striped ties, dressy shirts and jewelry — gold chains and medallions — recalling Lagerfeld’s own style. During an interview, Venturini Fendi herself was wearing a chunky signet ring from the collection with a curly FF logo created by Lagerfeld in the Eighties. Her shirt was covered in an abstract FF pattern, a Nineties Lagerfeld creation that recalled Italy’s Futurist artists. 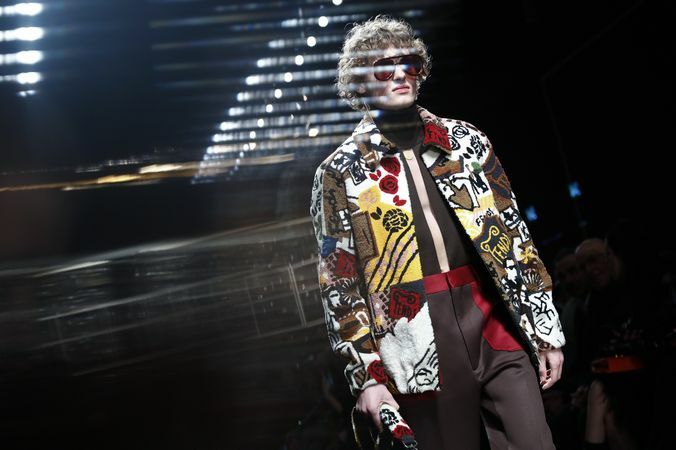 Fendi offset all that formality with street-y flourishes, including trenches, caps and puffers covered in a collage based on Lagerfeld’s images, sketches and inspirations. Knitwear, too, had a streetwise edge, multicolored and winking with shiny zippers or rows of tiny gold beads. This season, Fendi collaborated with the Tokyo-based company Porter, doing bags including the first Baguette for men — and the Peekaboo — in bonded nylon, as well as the brand’s signature croc, mink and Selleria leather, all with multipurpose straps and buckles. Another hard-edged bag came with a detachable plastic cover, which transforms into a shopper, all to serve the multifaceted Fendi man.